We’re into the last week of our countdown to October 3rd, when The Pietist Option: Hope for the Renewal of Christianity hits shelves. So let me offer one more glimpse into the pages of our book: having shared the acknowledgments, let me now show everyone the book’s dedication. If you didn’t know Jim and Glen and had simply read our book, it might seem like an odd choice. Just look at the index and you’ll find that many others influenced our thinking. Start with Philipp Spener and August Hermann Francke, and Martin Luther before them. Even from among the relatively small, little-known band of Mission Friends who make up the people of our denomination, we draw most heavily on the ideas of C.O. Rosenius, P.P. Waldenström, David Nyvall, Karl Olsson, Don Frisk, John Weborg, and Michelle Clifton-Soderstrom. Jim isn’t quoted a single time, though we certainly drew on his work curating voices from Covenant literature in the collection entitled Glad Hearts. 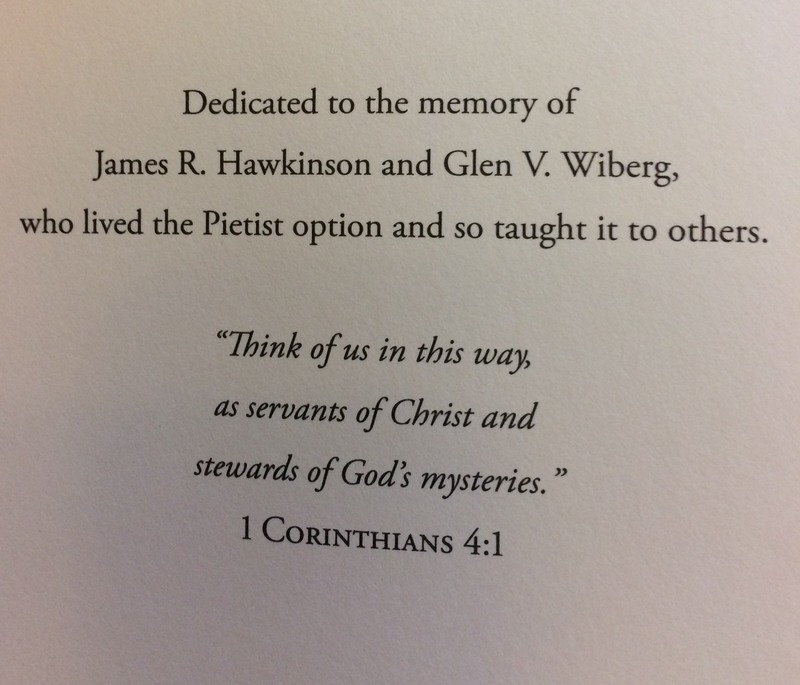 So why dedicate The Pietist Option to these two pastors, these “servants of Christ and stewards of God’s mysteries”? It wasn’t a hard decision. First, timing. Glen died just as we were completing revisions to our manuscript. Mark preached at his funeral, which included the verse from 1 Corinthians 4 that he had inscribed on our copies of his memoir. Finally, if Pietism holds Christianity to be more than an intellectual system — an ethos that is more caught than taught — then we wanted to pay tribute to two men who did more than talk and write about “the Pietist option.” Truly, they lived it. When I call Pietists people of the Resurrection, you can bet that a Glen Wiberg quotation isn’t too far behind. But if I live as a person of the Resurrection — hopeful, unafraid, and actively expecting God to make all things new — it’s because I saw Glen do it first. When I say that Pietism was first and foremost a movement to renew the Church, my mind immediately leaps to Jim’s pledge to “be a fool” for the Church, to “participate joyfully in her wider ministry, and in the seeking with her of that renewal we all so sorely need.” But if I actually participate in the life of the Church — if I “love her institutions, though I am not unaware of their faults” and I find myself “revived daily by her quiet, yet constant fellowship” — it’s because I saw Jim do it first. Truly, as Weborg once told Wiberg, “Pietism is the way the pastor does things.” It’s certainly the way these two friends did things.